Centennial Chromagraph. Courtesy Variable Projects. Alvin Leary, 9, was among the first fans to take in a St. Paul Saints baseball game at newly built CHS Field, which opened in May in downtown St. Paul, Minnesota. Leary (and his parents) are longtime Saints fans, but the size and scope of the new field wasn’t the only thing that impressed him. He was awestruck by Meander, an art piece on the field’s entry plaza. 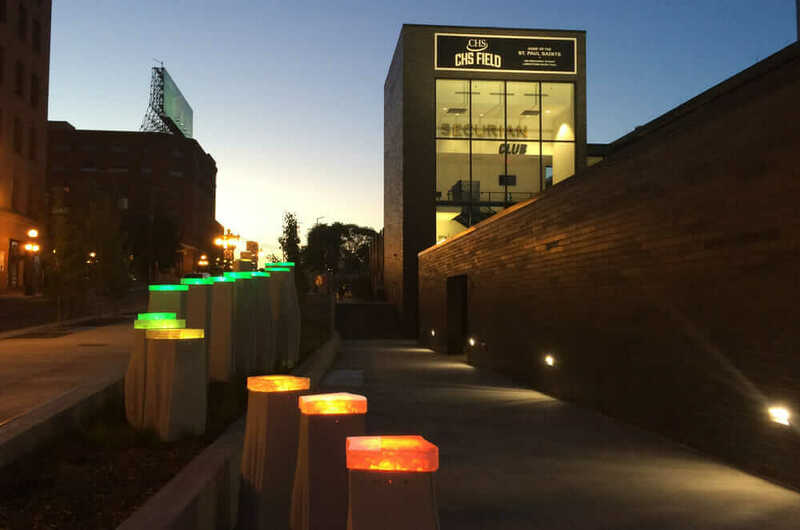 It uses one of the newest architectural design trends called data spatialization to depict more than 200 years of history for the Mississippi River, which runs through St. Paul. Data spatialization takes larges data sets—the types engineers, architects, scientists, and many other professionals can now simulate and visualize in three dimensions via software—into the physical world. 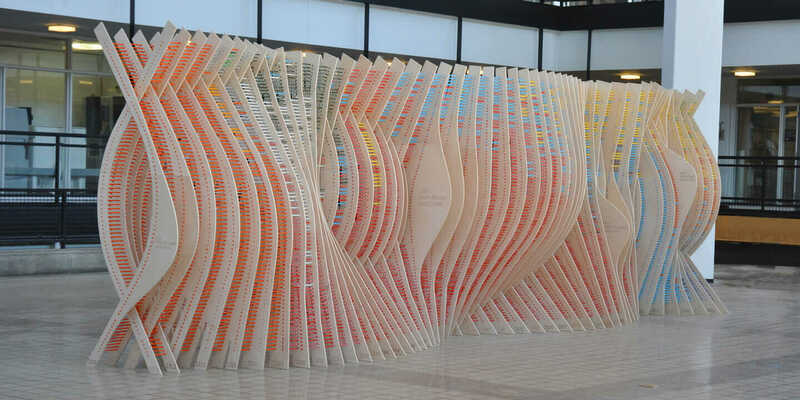 It’s an emerging way of representing that data artistically, says Adam Marcus, an architect and artist who created the project with his three collaborators—Daniel Dean, John Kim, and Molly Reichert—at the design-and-build company Futures North. Meander at CHS Field in St. Paul, Minnesota. Courtesy Futures North. Data spatialization is one way to do this, says Marcus, who also directs his own studio, Variable Projects, and is an assistant professor of architecture at California College of the Arts in San Francisco. Meander is made up of 15 concrete pillars, each of a different size and curvature and topped by a glass lantern lit with LED lights. The curves depict how the shoreline of the Mississippi changed from the 1840s to today. The Futures North group compared historical maps from 19th-century explorers and the U.S. Army Corp of Engineers’ maps with Google maps of today to view the changes in the shoreline. Then they created curves that mimic those changes. The height of each pillar corresponds to the position of each of the river’s 15 locks and dams. They change in height as the position they denote moves toward the river’s mouth in New Orleans. 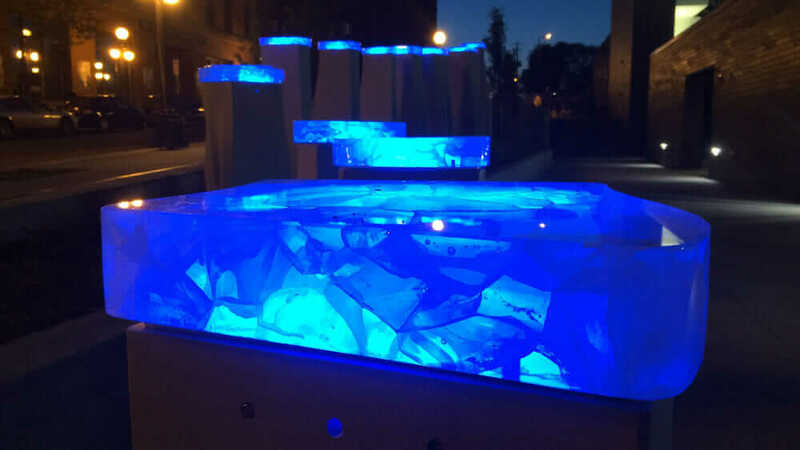 “The last dimension is the lighting, which slowly broadcasts three different visualizations of information: water temperature over the past 10 years, water quality—based on the amount of nitrogen it includes—and wind speed,” Marcus says. Futures North used information provided by the St. Anthony Falls Laboratory at the University of Minnesota. Jacques Finlay, associate professor of ecology, evolution, and behavior, helped the artists isolate data about the river that could be “transcribed” to art via data spatialization. According to Marcus, the data sets needed to include enough variation in order to provide enough visual interest. From left: 1. River geometry in section. 2. 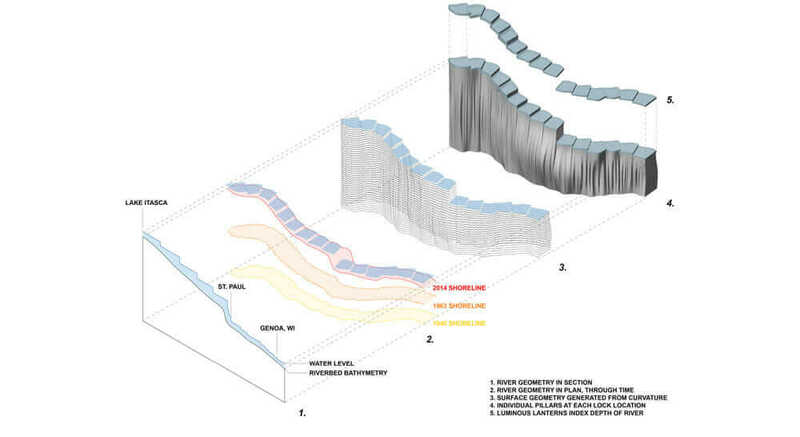 River geometry in plan through time, including 1840, 1963, and 2014 shorelines. 3. Surface geometry created from curvature. 4. Individual pillars at each lock location. 5. Meander’s luminous lanterns index depth of river. Courtesy Futures North. The team also interfaced with the design/build general contractor of the ballpark, Ryan Companies, to integrate the artwork with the building information model in Autodesk Revit. This was essential to coordinate the artwork with the building’s structure and landscape design. 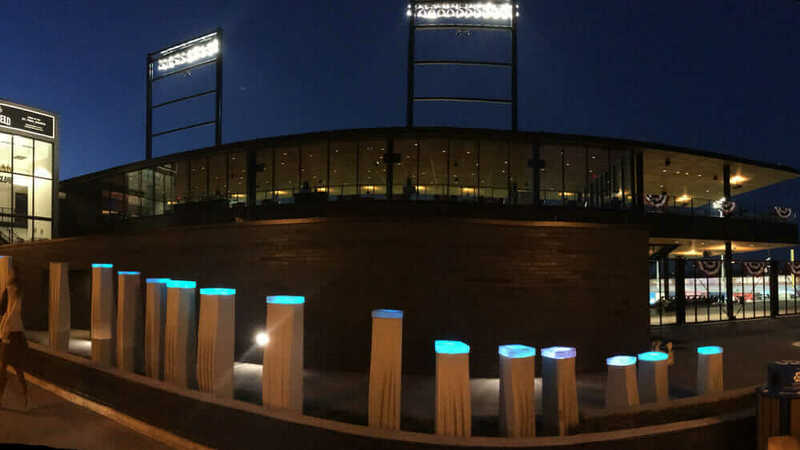 “The idea was, how can this natural resource be leveraged and celebrated to create an artwork that’s spatially dynamic and also engages people coming to the ballpark, walking by it, and fostering awareness of our local environment?” Marcus adds. Even those who don’t read the plaque near the piece and don’t know it depicts information about the river admire it solely for its beauty. His “other life” as an architect also plays a role in his interest in the push and pull of numbers, math, and built objects. Marcus first used data spatialization at the University of Minnesota when he and the graduate students he taught in an architecture studio class began exploring ways they could represent the School of Architecture’s 2013 centennial. 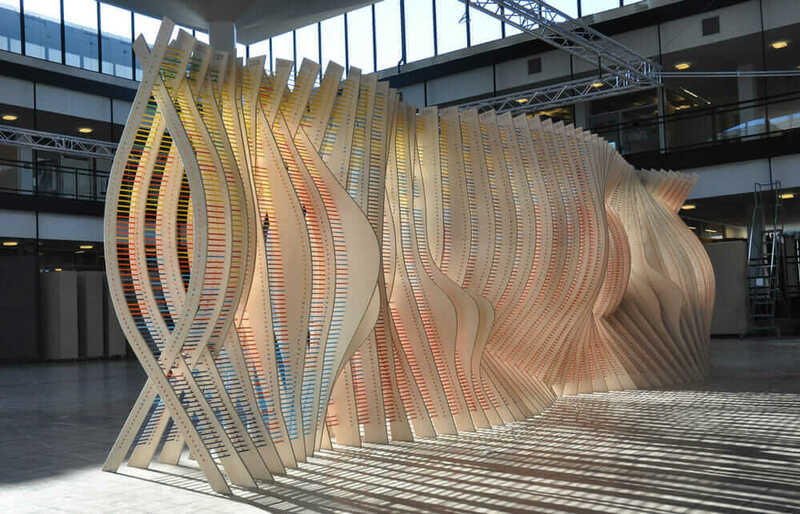 The resulting Centennial Chromagraph—which received a prestigious 2015 AIA Small Project Award—is comprised of 100 plywood ribs joined together with 8,080 colored No. 2 pencils. The curvature of the ribs expresses major historical eras and periods of the school such as the tenure of its deans and the buildings it has occupied. The color of the pencils reflects the changing composition of the school’s degree programs over the past century. The Bachelor of Architecture degree began in the 1930s and lasted until the late 1990s when it was replaced by a Master of Architecture—and this is represented by the large number of red pencils extending across that 60-year period. The students used computational software and a variety of software tools to analyze the roughly 5,000 students within the alumni database. “We were able to see what data is interesting for people to understand and what would be legible at a large scale,” Marcus says. And it worked. “People took pictures next to the certain year they graduated,” he says. He and his fellow Futures North collaborators plan to work on data-spatialization projects in the future, and Marcus will further investigate using the technique in architectural projects as well. The opportunities to depict data visually, whether as art or architecture, are all around us every day. Marcus, who now sees hard numbers in a new light, is up for the challenge.